If you’ve been in our church lobby, this will look familiar to you, but I wanted to offer it up to you as a freebie. Free free to download this image and print it off for your home to help you remember why we do what we do as a church community. It’s not just because this verse and others in the Bible tell us to do this. Though, that is a part of it. But, the bottom line is this – we are all messed up people who have made more mistakes than we can count. And if we were dependent on our own goodness to save us, we would be sunk. We cannot fulfill the demands of righteousness that God would expect of us if it were up to our abilities. There is not one of us who could live a perfect life. 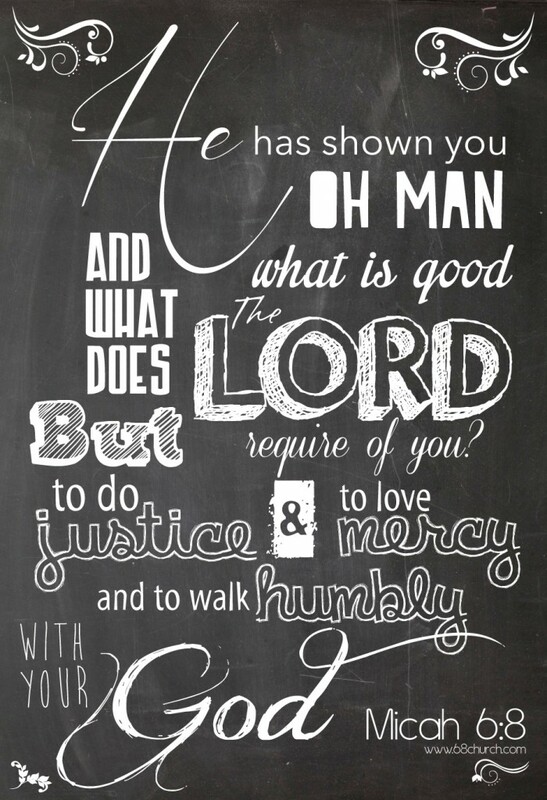 And since God has shown us such great mercy, we do justice. Not to earn something, but because we realize that if there wasn’t someone fighting for us, we would have nothing to fight for. We do justice because Christ died for us on the cross and justified us. And the greatest injustice of all is having a Savior, but not knowing He exists. We do justice to make His great name known. We do justice because all people are made in God’s image, and being an image bearer of God, they have dignity – no matter the wrongs they’ve done, the mistakes they’ve made, the sins they’ve committed or how they’ve been treated. Because God is rich in His mercy toward us, and does not punish us as our sins deserve. Because of his compassion, we love mercy. Not just for ourselves, but for everyone made in God’s image. We are so full of mercy, that we seek to be merciful in all opportunities. Because we have made too many mistakes to count and have done nothing on our own to deserve the grace in which we walk, we walk humbly. There is no one among us who hasn’t made mistakes. There is no one who is proud of every decision they’ve made. I have made many mistakes in my life. And I, like you, would love to go back and fix them. But, God doesn’t see me as the one who has made too many mistakes to count. Because I have put my faith in Jesus Christ, and I believe that He paid the price for my sins, God sees me through the life of his perfect, blameless son. And it is no longer I who lives, but Christ lives in me (Gal. 2:20). So, I know I have nothing to be proud of in terms of my own accomplishments, but for the Grace of God I am a sinner condemned to death – but in Jesus Christ I have everything I need. I hope you remember just how amazing this grace is that we experience. I hope when you see this verse you don’t see a list of things to be done, but you see a lifestyle to be lived. Not one of external motivations, but one of a deep internal motivation to Do Justice, Love Mercy and Walk Humbly.